The Mayan calendar predicted the world would end December 21, 2012 (12-21-12). It didn't, but it does raise interesting questions on how time calculated. And it drew attention to the fascinating Maya civilization and other ancient pre-Columbian Mesoamerica native cultures like Inca, Aztec, Toltec and Olmec. Here are free printable Mayan calendars, lesson plans on time measurement and Mesoamerica culture study activities, hieroglyphics and lifestyle lessons Aztec, Inca and Maya civilization. Printable Colouring Pages has six free printable images of Mayan calendars, referred to as Tzolkin or Haab, in the ancient tongue of the Maya civilization. Click here for another set of free printable Mesoamerica coloring pages. Be sure to teach students that Mesoamerica refers to a geographical region--around Mexico, Central America including Belize, Honduras, Guatemala and El Salvador--and to the pre-Columbian historical time period when the ancient Aztec, Zapotec, Teotihuacano, Olmec, Mixtec, Toltec and Maya civilization flourished. The ancient Inca civilization grew up around Peru in South America. How-to-Draw has free printable Mayan calendars. Words for each symbol listed near Mayan calendars. Here's a free printable decoder tools for Mayan calendars. Click here for free printable Maya civilization coloring pages. Here are more math lessons based on the Mayan calendar. 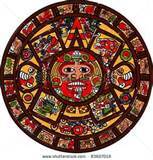 Here are lesson plans on the 20 day cycle of the Tzolkin or Mayan calendars, with inscriptions and codec hieroglyphics (picture symbols) used in the Tzolkin calendar, plus names and translations from modern Yucatec, classic Maya and English. Here are free printable math lessons, calendar converters and hieroglyphics from the solar Haab Mayan calendars. Edupics has free printable coloring pages from the pre-Columbian Mesoamerica Aztec, Inca and Maya civilization. Look for pictures of famous pre-Columbian works of art, hieroglyphics and ancient religious sites of Machu Picchu, Tenochtitlan and Chichen Itza or the Temple of Kukulkan (now listed in the new revised wonders of the world). Check out these links for free printable paper models of Chichen Itza and Machu Picchu and Tenochtitlan. Here are lesson plans on the monolithic Olmec heads and Toltec statues. Here's a free printable 161-page booklet of pre-Columbian Mesoamerica lesson plans on the Maya civilization. J.Q.Jacobs gives a detailed descriptions of the Haab and Tzolkin Mayan calendar along with images of their codices and instructions for use.